Presented at BASELWORLD, the latest addition to the XP line is the sophisticated and elegant L.U.C XP Skeletec epitomising the philosophy of essentials. Its mechanical self-winding movement, L.U.C Calibre 96.17-S, takes the art of meticulous workmanship in the field of Haute Horlogerie to extreme lengths. 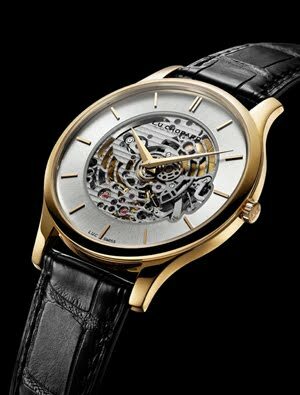 This ultra-thin movement equipped with two barrels is the first skeletonised calibre produced by Chopard Manufacture. A blend of technical sophistication and refined elegance characterizes the ultra-thin L.U.C Calibre 96.17-S. 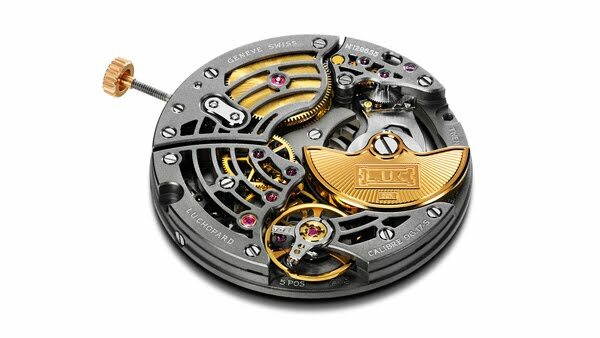 This self-winding calibre beating at a frequency of 28,800 vibrations per hour (4Hz), boasts a 65-hour power reserve thanks to the Twin® technology, a Chopard-patented system combining two coaxial barrels and representing a truly remarkable technical feat in light of the extreme slenderness of the 3.3 mm-thick movement. Its mainplate adorned with Côtes de Genève on the dial side, as well as its bridges, are meticulously openworked to reveal its inner workings. The latter are rhodium-plated black and create a contrast that cleverly highlights the gilded gear wheels visible both on the dial side and through the back. The nickel-plated sunburst satin-brushed dial forming a ring between the case and the heart of the watch enables clear readability of the time. The unexpected two-tone effect it creates with the 18-carat rose gold case adds considerable strength of character to this model that derives unique elegance from this distinctive design feature. Two gilded Dauphine-type hands and the inscription L.U.Chopard on the glareproofed sapphire crystal further enhance the refined appearance of this 39.5 mm-diameter ultra-thin watch. The L.U.C XP Skeletec watch – issued in a 288-piece limited series – comes on an alligator leather strap with an 18-carat rose gold pin buckle.